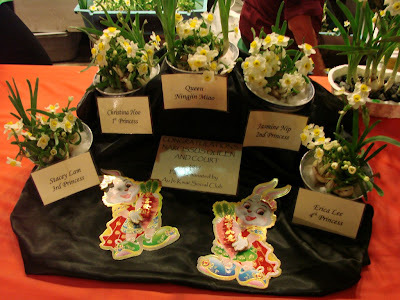 Every year the Chinese Chamber of Commerce crowns a Narcissus Queen and her court in conjunction with the Night in Chinatown. The Narcissus flower “Sui Sin Fah” is a symbol an auspicious lunar new year. Its delicate fragrance epitomizes purity of the heart and soul. These flowers represent the queen and her court. Unfortunately though we briefly did see the Queen I was unable to angle a photo but you can visit their webpage for the 2011 Narcissus Queen. This years queen was Ningjin Miao. The Chinese Lunar New Year is approaching on February 3 and to celebrate the Chinese Chamber of Commerce and the merchants of Chinatown have been celebrating all month. 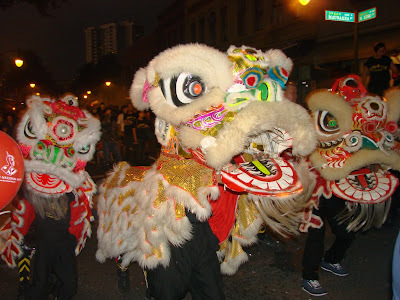 On this Night of Chinatown these three Lions (and many others) roamed the streets of Chinatown bringing good luck to the stores and restaurants amid crowds of people and fireworks. In the coming days we have more about Chinese New Year. 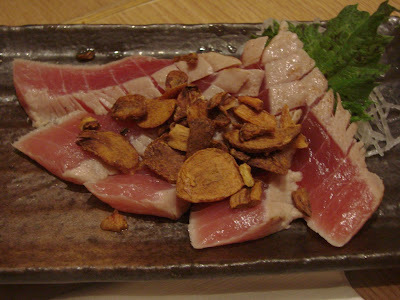 Today we feature the Ahi Tataki with Garlic Chips dish at Shokudo Japanese Restaurant. The ahi sashimi is lightly seared and served with delicious garlic chips and a homemade ponzu sauce. Just one of the many dishes we sample at Shokudo celebrating the three friends who have the birthday on the same day. Hope you had a great birthday Jade, Marsha and Ben.